A two-vehicle collision on the Sussex-Hampshire border near Liphook yesterday morning left two people seriously injured, according to police. Police are appealing for witnesses to the collision at 10.50am, which involved a Honda CRV travelling north and a Ford Ranger pick-up travelling south on the B2070 Old Portsmouth Road, near the Black Fox Inn. Both drivers involved had to be cut free from their vehicles by firefighters, police said. A police spokesman said: “The Ford driver, a 64-year-old man from Hambledon, Hampshire, sustained multiple, potentially life-threatening injuries and was flown by air ambulance to Southampton General Hospital. 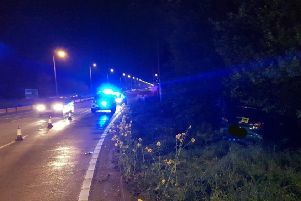 “The Honda driver, a 34-year-old woman from Liphook, also suffered multiple injuries and was taken by land ambulance to Southampton General Hospital. Anyone who saw what happened or who noticed either vehicle being driven shortly before the crash is asked to contact police online or phone 101, quoting Operation Thorgate.